The home-decorating saga of unhandy people continues. Mr. Glad and I have more time lately, for home-improvement projects of all kinds, but we aren’t the sort to relish this sort of activity. I’d rather rummage through my sewing room clutter, or read blogs. My husband likes to practice on his drums. And when more responsible homeowners might be painting or sawing to improve their surroundings, we might be taking a walk to Starbucks to sip our caffeine and read poems for an hour. But on the way home my mind might race ahead and arrive before us, to contemplate the physical realities of our house, and the danger that our procrastinations pose to our guests. This monchromatic photograph may remind some of you of a time two years ago when I asked you dear readers for help with our entryway floor safety problem. I am embarrassed to say that we have taken this long to solve it, though not for trying somewhat faintheartedly again and again. We researched Amanda’s rug idea. 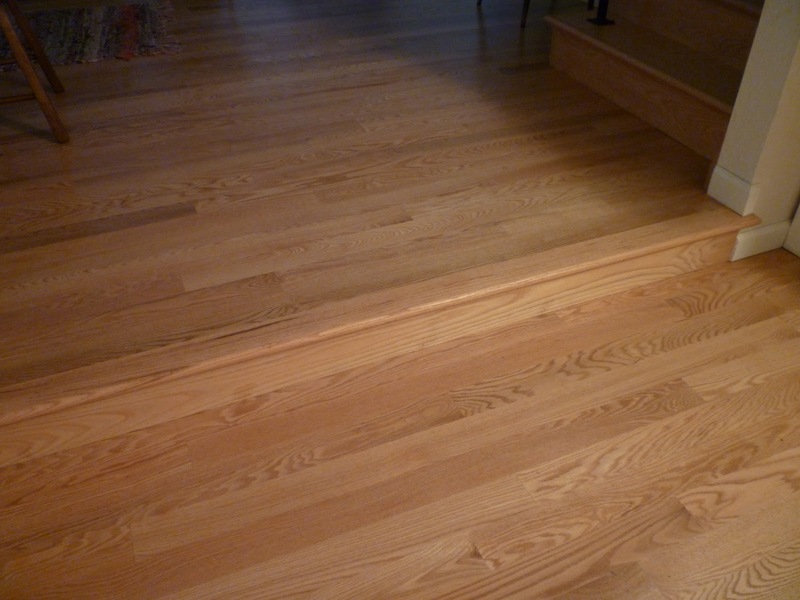 We contacted several people about Mark’s wood inlay idea. I borrowed a dozen books from the library thinking I might stencil the floor myself. I lay in bed thinking how some lights such as Celeste suggested could be installed under the lip – thinking how at Christmastime it would be fun to switch them for colored lights! All this time guests went on stumbling and occasionally going all the way down, as we envisioned broken legs or noggins and how ashamed we would be of our negligence if that happened. Recently, when we were waiting for one of the contractors to tell us exactly when he was coming to do the job that it turned out was too small for him to even use his good manners on, I applied zig-zags of thin red masking tape. We were expecting first-time guests and feared for their safety. The tape aged and cured while we came to realize that Something Else must be done. Now we have a rug. I photographed it without vacuuming it first because my husband was watching a movie and I didn’t want to disturb him with the noise. 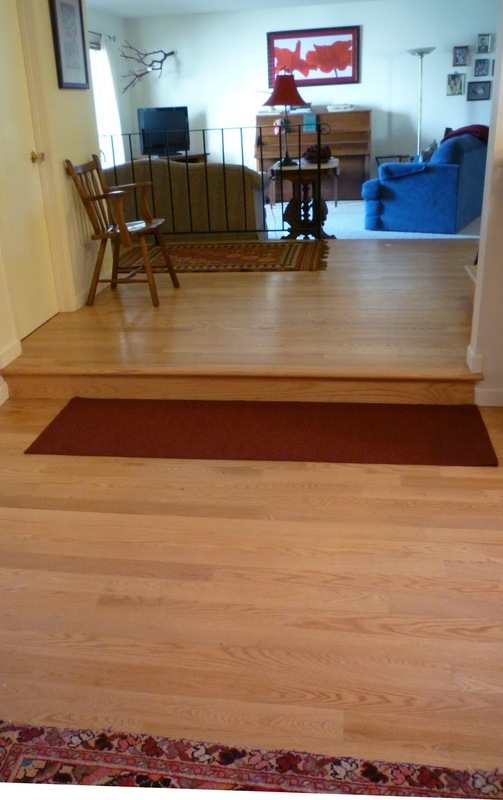 It’s not the most stylish rug, but it is the narrowest one we could find in a workable color. Perhaps someday someone will like to do something more artistic and permanent to this step, but for now we are just relieved to not have to think on it any longer. For some reason I put the most ho-humly functional rug at the beginning. 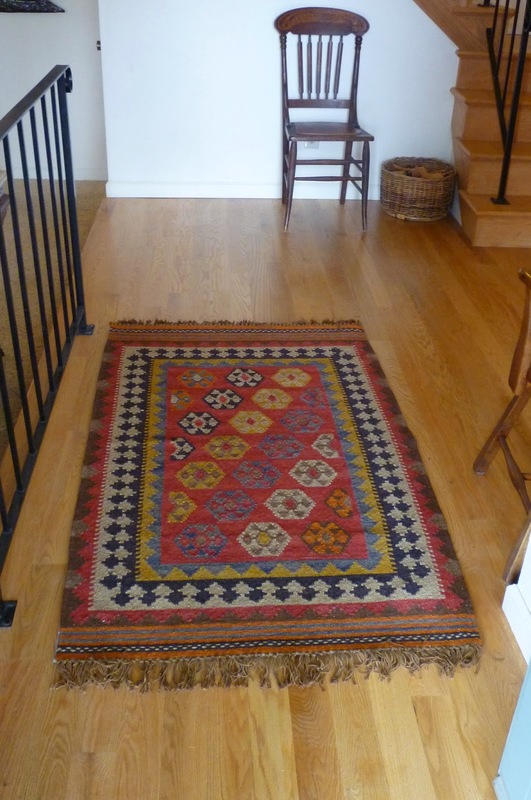 The other solved-by-rugs situations include more beauty. An expanse of wall that has been needing something for three years now has a rug to make the toy area of the living room more cozy. This is my view from the kitchen, of a wallscape that has warmed up considerably. While I was rug shopping I decided to update and brighten up our entry with a new rug for the front door. I had to open the door to get enough light on my subject; that is a little piece of its blue exterior lower right. Rugs are my new favorite artistic indulgence, and I’m enjoying all the time that has been freed up now that I’m not perusing decorating websites anymore. It’s a beautiful life. I love rugs! 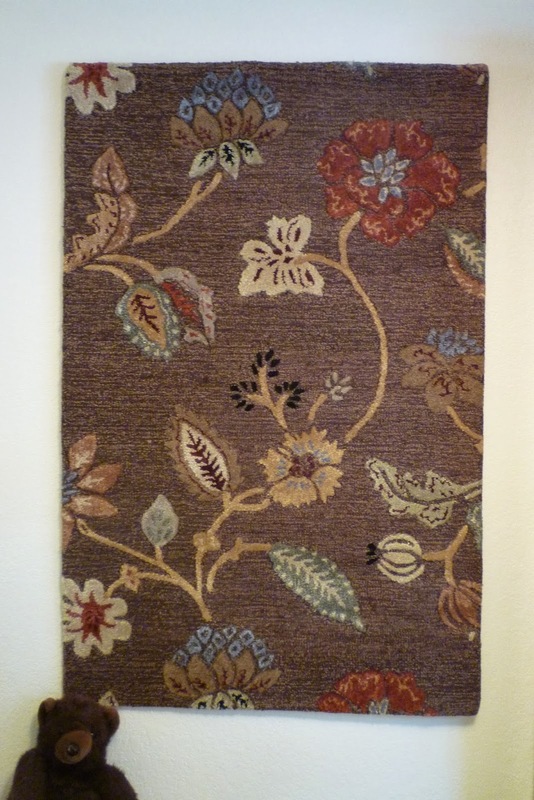 I have a really pretty floral rug under my dining room table that reminds me somewhat of your floral wall rug. I really like the new rug at the entrance. A lot. The step rug was a smart idea. 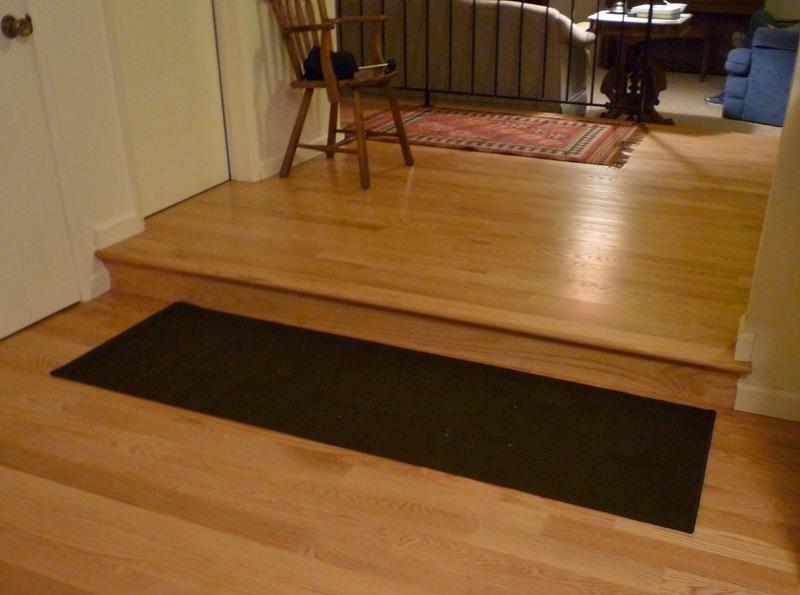 Perfect idea for your step, and easy, too. I like your other rugs, too. Very pretty. I think it looks great. My dh and I are not particularly interested in doing home improvement projects either, but that doesn't mean I don't have idea rattling around in my head. You have some lovely rug hooking places in your area. I mean if you were just ever wanting to hook your own rugs. 🙂 I like your choices though. I am so bad at decorating, I always think I can live in a house that looks like a magazine or one that people like to visit. I settle on the latter. Just looking at your pictures and that chair and the lovely bookcase, made me want to just sit and read. It will be time for me to decorate for Christmas and I will again stand in the middle of rooms and stare and wonder why I just can't see things, like my Mom could. Oh well, she didn't read books so I guess it is a trade off, right? I think your days sound very nice. Beautiful rugs for a beautiful life! You remind me of the William Morris principle- along the lines of not having anything in your room that isn't at once both beautiful and practical! I must say that both of your “unhandy” pastimes sound much more appealing than home improvement. Your home does look very inviting as is. The rugs add a nice touch. I love rugs too — esp. little rugs, although they do shift around on you. I like all your solutions. That final rug is particularly beautiful. Good job! Now that we have NO wall-to-wall carpeting, and all hard floors, I need to put some thought into rugs myself. 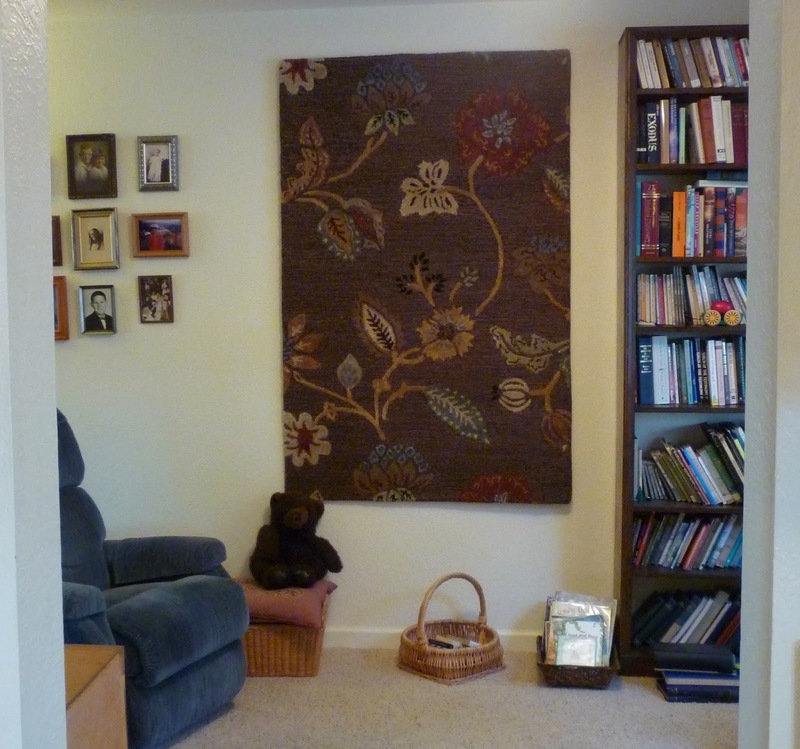 I added a new picture to the rug blog post, because I replaced the dark brown rug with a reddish one.